Have you ever tried potato pan cake? People also call it latkes. 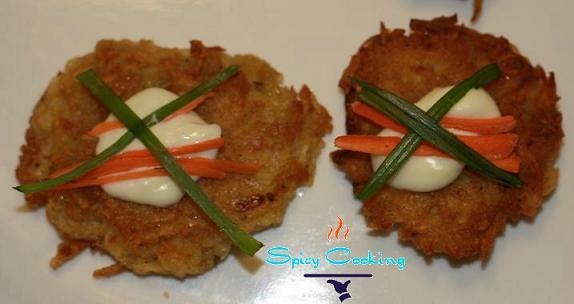 There is various ways for making potato pancake, you can make it with mashed potato or with shredded potato. I love to make it with shredded potato. You can serve it as a starter in your parties and hope your friends/family will enjoy it. I know you must be wondering it is low fat or not? Well you can consider it as a low fat pancake. The recipe I have given here is for 4-5 people. Wash and peal the skin of potato then shred it with the cheese shredder. Then keep it in a large bowl with cold water for ten to twenty minutes. Squeeze all the water from potato and make it dry. Add flour, chili powder, garlic powder, egg and salt to the potato and mix it well. Make small round shape for pancake with this potato. In a pan add oil, when oil become hot place the potato and fry it in a low to medium flame till both side become golden brown and crispy. Now do the same with rest of your potato batch by batch. Now the potato pancake is ready to serve with your favorite sauce. I Love to eat this with mayo. Serve hot to your friends and family, hope they will enjoy it. I love to eat this with my all-time favorite masala tea. This is new for me, i never ate it anywhere. This seems to be catchy, I will try to make this today and let you know how it turns out. Hi Jeeta, Thanks a lot. Let me know how your pancake came out? Enjoy it with your family and friends.